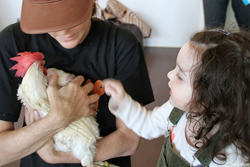 Oakland shelter partners with Animal Place to match urban farmers with rescued hens. “Thanks to our partner Animal Place, this event offers the East Bay public a unique opportunity to learn about the humane treatment of chickens,” said Allison Lindquist, East Bay SPCA President and CEO. On Sunday, October 18, urban farmers will have their day at the East Bay SPCA’s Oakland Adoption Center. 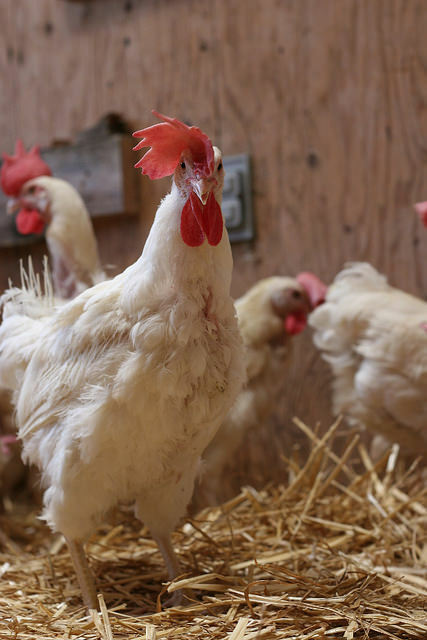 The SPCA, which normally houses only cats and dogs, is hosting a special hen adoption event for fellow animal welfare group and sanctuary, Animal Place. Potential adopters must apply in advance and be pre-approved by Animal Place. California voters overwhelmingly passed Proposition 2 in 2008 and implementation began just this year. Among other things, the ballot measure required that egg-laying hens raised in California have enough space to able to stand up, lie down, turn around, and fully extend their wings. The rescued hen adoption event will be held at the East Bay SPCA Oakland Adoption Center located at 8323 Baldwin Street on October 18 from 12:00 noon to 2:00 pm. Please complete an adoption application online before attending the event: http://animalplace.org/adoptable-chickens/. Get more info about caring for a chicken here: http://animalplace.org/rescue-ranch-animal-care-info/. Founded in 1989, Animal Place's California animal shelter fills a much-needed niche of farm animal rescue, sanctuary, education and adoption. Animal Place is one of the largest and oldest animal sanctuaries in the nation. We operate a 600-acre sanctuary in Grass Valley, California, and a 60-acre animal shelter in Vacaville, California. Animal Place extends compassion to all life with a special emphasis on farmed animals. This is executed by providing permanent sanctuary, education, legislation and appropriate placement of needy animals. The East Bay SPCA is a 501(c) 3 nonprofit committed to the welfare of cats and dogs in Alameda and Contra Costa Counties. Established in 1874, the East Bay SPCA is one of the nation’s oldest independent humane organizations and receives no funding from local, state or federal governments, or any national animal welfare organization. The mission of the East Bay SPCA is to eliminate animal cruelty, neglect and overpopulation by providing programs and education that support people and companion animals. Operating three facilities in Oakland and Dublin, the organization offers adoption centers, spay/neuter surgery centers and companion animal behavior and training classes. The full-service Theodore B. Travers Family Veterinary Clinic, is located on the Oakland campus of the East Bay SPCA and is AHAA accredited. For more information visit eastbayspca.org.